Last night I arrived to jiu jitsu rather late due to some work obligations running late and I was greeted by an unexpected tournament. To my big surprise I performed rather well, getting five wins out of five matches. Four submissions and one on points! The first submission was a very quick collar choke, the second two were bow-and-arrow chokes and the last was a modified Ezekiel choke from half guard. Quite happy with the result. Don’t train so hard you can’t train tomorrow. Last night’s training was not amazing. I believe I’ve been steadily progressing over the last couple of months and I’ve been feeling pretty good about it, but yesterday I got my arse kicked by pretty much everyone I rolled against. I think I’ve become a little bit predictable to my training partners. I like to play the deep half guard game, and it has left me vulnerable to a couple of things that I need to work at. I do especially poorly against people who play a very dynamic game, with a lot of movement. I’ll be going on holiday for the coming few days, which will give me some time to think about this while I let my body heal a bit. Let’s see what I can come up with. Last night we had a fairly free form BJJ class. This started because I arrived a bit early and started rolling with one of the other students, for fun, to warm up, before class had started. As other students arrived in time for class, they joined in, and so the class had started without any formalities. We are a school that’s fairly light on formalities as it is — I don’t have to call my teacher “professor”, nor do we bow before we enter or the leave the mats. No, we have music playing and the atmosphere is relaxed. So the class consisted of us just rolling five minutes at a time, switching to new partners. An hour went by like this and it by the time the end of the class approached, Cesario, my teacher, called us together and started going over some of the individual mistakes he saw us make, often repeatedly. “You keep losing position because you don’t fight for the underhook,” “when you try to do a hip bump sweep you don’t turn enough to attack the weak plane,” etc. We got some valuable feedback. After that, he went down the line of all the students and describe the fundamental flaw in our game. For instance, one student got a great compliment; he learned very quickly and had a tremendous understanding of the body as it relates to BJJ, but that he couldn’t translate that to a live roll and that he should start rolling the way he trained. It’s true in more ways than one. I am a romantic, an escapist and a dreamer. My father taught me that. I get obsessed with stories, with narrative. I also don’t primarily practice BJJ for the competitive element. So I do end up rolling for the game element, for the fun of it, and I do like to experiment. I’ll try and go for worm-guard because I want to see what I can do with that in a live roll. 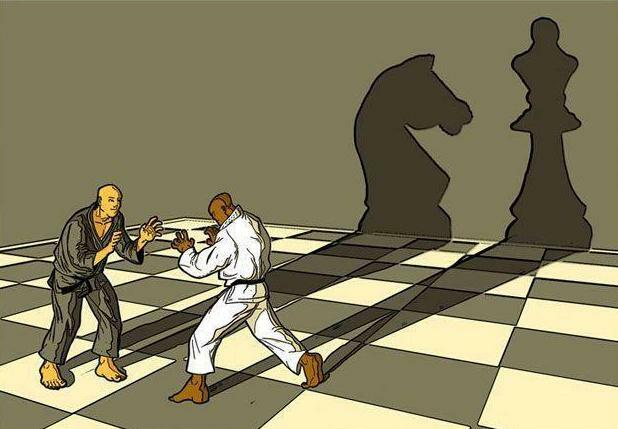 To me, BJJ is a game of chess. To Cesario, it’s a fight first, game second. In April I blew my knee out. It happened while rolling. I caught someone in a calf-slicer and I couldn’t quite finish it. I decided to push the knee of my trapping leg deeper into the back of the knee of my opponent and I heard the tendons pop. I think this is the closest I’ll ever come to being Major Kusanagi as she rips her arms off her body trying to rip open the console panel off the battle tank. Okay, so maybe I’m exaggerating. I healed up in about a month. I didn’t need another body, but still, I was unable to train for a a few weeks. I went back to training and the second class in I dislocated by elbow. That left my elbow sore, and I could train two weeks later. Then I re-injured an old injury in my neck. A few years ago, I got injured during training. I couldn’t sit or walk without incredibly pain flaring down from my neck and into my left shoulder and arm. Even laying down was only comfortable in certain very specific positions. I was bed-ridden for three days before things started to improve. The problems lingered for a long while until I found a hernia specialist that helped me with my neck, and I started feeling better in no time. It turned out to be nerve damage. Or rather, it was a nerve that had gotten quite a beating and was overly sensitive. So about two months ago I re-injured that same old injury. Initially, it wasn’t as bad as before, but it progressively got worse as I kept cycling to work and I started running more to compensate for not being able to train. I went to the same physiotherapist that helped me before and things steadily got better. Then holidays came. And after that I had to go in for a little surgical procedure (which is a story for another day) that has left me with some stitches. All in all, it’s been a hell of a few months. Now, this certainly isn’t the first time I’m not capable of training, but it has been an exceptionally long time where I couldn’t do anything, not even run or bike. And I’m starting to notice it’s taking its toll on my mood. And my sleeping pattern. Currently, I like my job, I’m in a loving relationship, my siblings are doing well and I have no real major worries in my life. And yet, I don’t feel particularly motivated to do anything constructive — no project to keep my occupied, no goals I want to achieve or new things I want to learn. Usually I have something like that to occupy me. A story I want to write, a book I want to read, learning how to solve a rubik’s cube faster, learning how to make a particular cocktail, some project I want to code… But now, nothing. No desires. And I’ve been sleeping poorly. I’ve never had problems sleeping and I can’t rightly say that compared to actual insomnia I am having problems now, but I tend to sleep early and wake up early. And I wake up in the middle of the night, which hardly ever happens. I think it’s a general sense of restlessness. All in all, it’s not bad, but it’s also not good. I think the lack of exercise is really getting to me.